Posted by Maggy Parries on Okt 10th, 2016 and filed under Allgemein, Automotive, Breaking News, Featured. You can follow any responses to this entry through the RSS 2.0. Both comments and pings are currently closed. 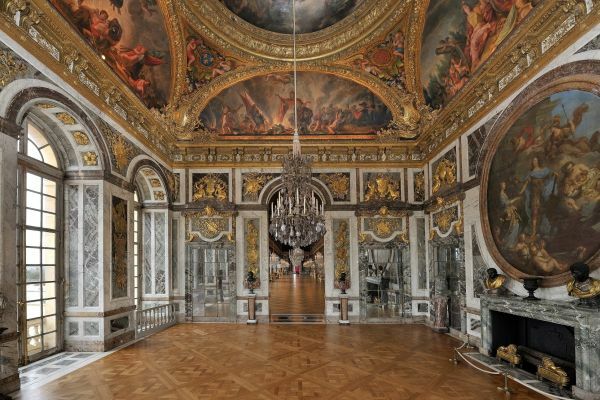 Groupe Renault is working with the Palace of Versailles for the first time ever to help fund the restoration of the palace’s Peace Room. This considerable task, set to begin in 2017 and run for 18 months, forms part of a wider renovation programme that has been underway in Versailles for several years. Putting the shine back on the Peace Room will help return the Grand Apartments to their former glory, restoring all the splendour, architectural coherence and legibility of the Palace of Versailles. ‘Extending the Hall of Mirrors and forming the first room of the Queen’s Grand Apartments, the Peace Room epitomises the radiant majesty of Versailles. It embodies all the talent of the craftsmen who built this palace. All French arts and decorative trades are united here: it is history made manifest. This salon has stood through the ages as a tribute to peace, and remains an allegory of France’s influence in the world. Restoring it to its former magnificence required a particular kind of commitment and a deep-seated recognition of the universality of this symbolic place. Groupe Renault has a worldwide presence and is now enabling this piece of history to live on’ Catherine Pégard, President of the Palace, Museum and Estate of Versailles. ‘As a long-standing patron of the arts, primarily through our involvement in international film festivals and our art collection, Groupe Renault is delighted to be supporting the Palace of Versailles in such a momentous architectural feat as the restoration of the Peace Room. France is lucky to possess, in the Palace of Versailles, such an exceptional national treasure that contributes to our country’s identity abroad. At Groupe Renault we stay true to our French roots, and today we are proud to back this emblematic project’ Groupe Renault Chairman and CEO Carlos Ghosn. Groupe Renault has forged links with the art world throughout its history and holds more than 300 works in its Renault Modern Art Collection. Mostly acquired from 1967 to 1985, the pieces – by painters, sculptors and visual artists including Dubuffet, Tinguely and Vasarely – can be seen at various company premises. Groupe Renault has also supported filmmaking for many years, partnering the Cannes Festival for the past 33 years as well as the Deauville American Film Festival and the Venice Film Festival. In teaming up for the restoration of the Peace Room, Groupe Renault and the Palace of Versailles are reinforcing a partnership that dates back to 2013. For the last three years, Groupe Renault has provided 23 electric vehicles (10 Twizys, 10 Kangoo ZEs, 3 ZOEs) for daily use by staff at the Palace, Museum and Estate of Versailles (security officers, garden maintenance, administrative departments, etc.). A network of 30 charging points has now also been introduced across the grounds of Versailles. This unique partnership contributes to environmental preservation in the gardens, as well as the comfort and safety of 12 million visitors every year. Designed to form a coherent whole with the Hall of Mirrors and the War Room (its counterpart on the north side), the Peace Room was the fruit of a collaboration between Louis XIV’s chief architect Jules Hardouin-Mansart and Charles Le Brun, First Painter to the King. The room was designed between 1681 and 1686 and is characterised by its superb polychrome marble, including Sarrancolin marble, green Campan, Campan Grand Mélange, Rance and white Carrara marble. Marble panelling lines the walls for the entire height of the room, and further visual riches are provided by reliefs sculpted in gilded lead or bronze, interspersed with mirrors. Crowning it all is a ceiling painted by Le Brun. This interior, designed to celebrate peace, completes the iconography displayed in the Hall of Mirrors commemorating civilian and military actions by the Sun King that led to peace and prosperity in his kingdom. The Peace Room has largely retained its original architectural design. The room is now in need of restoration due to the dilapidated state of its marble and paintings. The painted surfaces are lifting away and what is more, they were profoundly altered in a previous restoration phase carried out in the 1950s that left Charles Le Brun’s paintings unrecognisable. The work planned has two facets: firstly, restoring the paintings comprehensively to shed new light on the First Painter to the King’s artworks, and secondly, reinstating the architectural decorations to create a worthy setting. This monumental project is to begin in 2017, lasting 18 months, and will be project managed by France’s chief architect for Historical Monuments, Frédéric Didier. Once completed, the restoration of the Peace Room will return the Grand Apartments to their former glory, restoring all the splendour, architectural coherence and legibility of the Palace of Versailles.